Recently, my daughter rediscovered this treasured board book in our collection by Sylvia Long, one of my favorite author’s and illustrators. 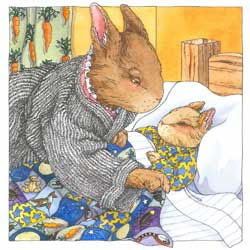 Hush Little Baby by Sylvia Long is an adaptation of the traditional lullaby made famous by Carly Simon and James Taylor. Included in the book is “A Note from Sylvia Long” explaining why she felt an adaptation was necessary. She writes, “As much as I love being an artist, my favorite and most important profession has been being a mother. I sang and read to my children, just as my mother sang and read to me. 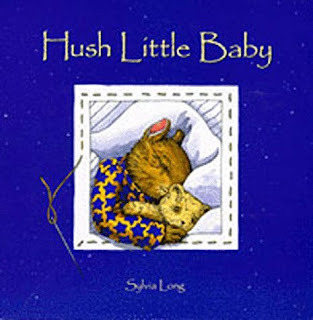 One of the songs that has bothered me as an adult is the original version of “Hush Little Baby.” In it, a mama offers her baby comfort by promising to buy him or her all sorts of things (a mockingbird, a diamond ring, horse and cart, etc.). It seems much healthier to encourage children to find comfort in the natural things around them and the warmth of a mother’s love. This belief was my inspiration for a new version, which I hope you will enjoy as much as I enjoyed creating it.” I couldn’t agree more with Sylvia! In today’s culture of overconsumerism, our children do not need to be taught that making purchases will give them comfort. Thank you Sylvia Long for these beautiful lyrics and amazing illustrations.